I teach at SPINCO because of the outlet that it provides both myself and my riders. I love that spin allows me to be creative through my choreography and is a healthy way to decompress both mentally and physically through fitness. 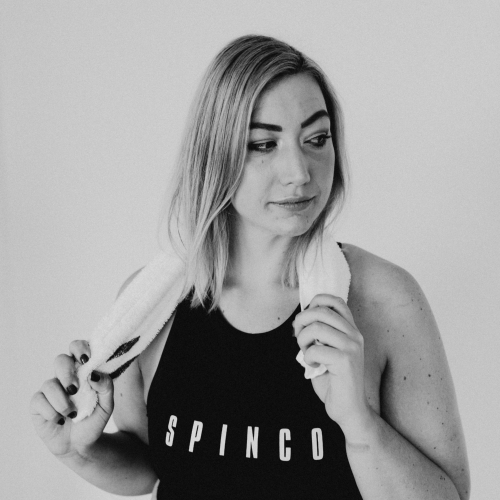 I also love that SPINCO offers a fun, energetic and judgment free community that is crucial to all fitness journeys, including my own! The SPINCO experience is what motivates me to jump on my bike every class! I love my beats high, lights low and the unique atmosphere that takes place in the spin room. Each 50 minute class provides me with an opportunity to let everything that is outside of SPINCO's doors go and focus on myself and my riders. Every class, I aim to challenge and improve myself by stepping out of my comfort zone and taking my ride to the next level! I want my riders to feel strong, challenged and like they are a part of our SPINCO team after each of my classes. I want my riders to allow themselves to become fully immersed in the SPINCO experience, allowing themselves to have fun in class and to leave the studio feeling the 'spinner's high', motivated to strive further towards their personal and fitness goals. Anything that gets me pumped up to ride! My favourite music ranges from dance music, to country, to classic rock - you never know what you are going to get. Hiking and exploring new trails in the mountains.